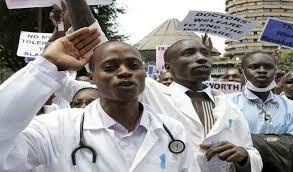 Doctors have threatened to unfurl a crippling strike citing unfavourable economic conditions that have virtually wiped off their salaries. Mxolisi Ngwenya, spokesperson of the Zimbabwe Hospital Doctor’ Association (ZHDA), told the Daily News on Sunday yesterday that the doctors are not happy with a number of issues that include unfulfilled promises, as well as the unsustainable salaries. “Doctors are very much disgruntled with the situation…talks have been going on for a long time with government, however, there has been no tangible output. A lot of members are contemplating on embarking on an industrial action,” Ngwenya said, adding that the initial plans were to officially start the industrial action yesterday. He said the disgruntlement within the sector is palpable. Among some of the issues that the doctors are complaining about is the lack of proper equipment in hospitals, price increases of basic commodities against eroded RTGS salaries and the move by government to charge duty on car imports in foreign currency. Ngwenya said some doctors had already stopped reporting for duty in some institutions. “I have, however, received reports that some members have already started their industrial action, saying that they have no fuel or bus fare to report to their work stations,” he said.